BCCondos.net (www.bccondos.net) is the largest and most comprehensive online source for condominium and townhouse listings and sales information throughout BC. We are a resource for Buyers and Sellers of condos and townhouses by offering a complete building specific database of unique information for every building, every MLS® listing, building rentals, building sales history, building open houses, individual floor plans and are adding something new every day (check back often). BC Condos offers a wide variety of incredibly detailed information searchable by building, listing type, Real Estate Board, Area, City or Neighbourhood. Each containing descriptions, pictures, interesting facts, nearby amenities, walk score, school catchments, zoning types and much more to help guide the consumer in the right direction. Additionally, we offer dedicated professional area specialists that will answer any questions that you may have, make any necessary appointments to view a property and assist you to achieve the most efficient and profitable real estate experience in the shortest amount of time. Abbotsford is the largest city by area in British Columbia. It is home to the University of the Fraser Valley, TRADEX and Abbotsford International Airport. The municipality's southern boundary is the Canada – United States border, across which is Sumas, Washington. Abbotsford is bordered by Langley to the west, the Fraser River and Mission to the north, and Chilliwack to the east. Much of Abbotsford has dramatic views of Mount Baker (to the southeast) and the Coast Mountains (to the north). Abbotsford's colonial development began when the Royal Engineers surveyed the area in response to the Gold Rush along the Fraser River in 1858. This led to the building of Yale Road (today Old Yale Road), the first transportation route to link the Fraser Valley. Settlement grew and the production of butter, milk and tobacco began by the late 1860s. In 1889 former Royal Engineer John Cunningham Maclure applied for a crown grant to obtain the 160 acres (0.65 km²) that would become Abbotsford. There are 311 buildings / complexes featured. The community of Agassiz, with a population of just over 6000, rests at the intersection of Highway #9 and Highway #7 and offers all the conveniences one might need. There are 23 buildings / complexes featured. his growing multicultural urban centre is in the heart of Metro Vancouver, with Downtown Vancouver, the North Shore Mountains and the Vancouver International Airport less than 25 minutes away. The residents unanimously chose to name it after legislator, speaker, Freemason and explorer, Robert Burnaby, who had been private secretary to Colonel Richard Moody, the Colony of British Columbia's first land commissioner in the mid-19th century. There Are 47 buildings / complexes featured. Burnaby East is a general name for a smaller neighbourhood in the City of Brunaby. It is bordered by Boundary Road to the west, Imperial and Mayfield Streets to the north, 4th Street to the east, and 10th Avenue and Fraser River to the south. Burnaby East also known as Burnaby Edmonds borders with New Westminster. North Burnaby is a general name for a large neighbourhood in the City of Burnaby that includes a number of smaller ones. It stretches from Boundary Road in the west to Burnaby Mountain with Simon Fraser University in the east and bounded by Burrard Inlet to the north and the Lougheed Highway to the south. It is a desirable place to live for many local and immigrant families. A number of major arteries run through this neighbourhood, primarily the high-traffic Hastings Street connecting North Burnaby with Downtown Vancouver and Port Moody, Willingdon Avenue linking it to Kingsway and Metrotown, and Kensington Ave going south to Canada Way and New Westminster. West Coast Express, a commuter train connecting eastern suburbs with Downtown Vancouver, runs through North Burnaby along the south shore of the Inlet. There are 246 buildings / complexes featured. Burnaby is a city in British Columbia, Canada, located immediately to the east of Vancouver. It is the third-largest city in British Columbia by population, surpassed only by nearby Surrey and Vancouver. Burnaby occupies 98.60 square kilometres (38.07 sq mi) and is located at the geographical centre of the Metro Vancouver area. Situated between the city of Vancouver on the west and Port Moody, Coquitlam, and New Westminster on the east, Burnaby is further bounded by Burrard Inlet and the Fraser River on the north and south respectively. Burnaby, Vancouver and New Westminster collectively occupy the major portion of the Burrard Peninsula. There Are 240 buildings / complexes featured. Chilliwack is the second largest city in the Fraser Valley Regional District after Abbotsford. The city is surrounded by mountains and recreational areas such as Cultus Lake and Chilliwack Lake Provincial Parks. There are many outdoor opportunities in the area, including hiking, horseback riding, biking, camping, fishing, and golf. Chilliwack is the location of the head offices of the Fraser Valley Regional District. In 1857, gold was discovered in the Fraser Canyon. By 1858, over 30,000 gold miners had trekked to the goldfields, most travelling through the Chilliwack area. By the mid 1860's several farms had grown up around the steamboat landings on the Fraser River called Miller's Landing, Sumas Landing and Chilliwack Landing. The Township of Chilliwack was incorporated in 1873, the third municipality in British Columbia. Initial settlement was along the Fraser River at Chilliwack Landing. Steamboats were the main mode of transportation, carrying goods and passengers between Chilliwack and New Westminster. There are 166 buildings / complexes featured. Cloverdale is an historic town and designated town centre of Surrey, British Columbia, Canada, located near Langley, which is east of Vancouver. The town was founded initially as a small farm community in 1870 for its fertile land and temperate climate, and has since become enveloped by suburban sprawl from Surrey, making it a small town in the suburbs. Cloverdale is known by some as the historic centre of Surrey, B.C., and is home to many heritage sites. One of its oldest buildings, Christ Church, was built in 1882 and still stands today, and though it is no longer used for worship, it is a popular location for weddings. Cloverdale is also the home to the City of Surrey's official Museum. There are 131 buildings / complexes featured. Coquitlam is situated some 10 to 15 km (6.2 to 9.3 mi) east of Vancouver, where the Coquitlam River connects with the Fraser River and extends northeast along the Pitt River toward the Coquitlam and Pitt lakes. Coquitlam borders Burnaby and Port Moody to the west, New Westminster to the southwest, and Port Coquitlam to the southeast. Burke Mountain, Eagle Ridge, and 1,583 m (5,194 ft) tall Coquitlam Mountain form the northern boundary of the city. Coquitlam's area, 152.5 square kilometres (58.9 sq mi), dwarfs the other communities in the Tri-Cities; it is about six times larger than either Port Moody or Port Coquitlam. Southwest Coquitlam comprises the original core of the city, with Maillardville and Fraser River industrial sector giving way to the large residential areas of Austin Heights. There are 294 buildings / complexes featured. Ladner was created as a fishing village on the banks of the Fraser River. It is a part of the Municipality of Delta, British Columbia, Canada, and a suburb of Vancouver. Named for Thomas and William Ladner, who came to the area in 1868 and began large farming and fishing operations, it developed as a centre for these operations. The ferry at Captain's Cove allowed for access across the river to Richmond, British Columbia. The George Massey Tunnel provided a permanent connection in 1959. Ladner and its suburban neighbour to the south, Tsawwassen, make up the unofficial region known as "South Delta". There are 71 buildings / complexes featured. The Township of Langley is a district municipality immediately east of the City of Surrey in southwestern British Columbia, Canada. It extends south from the Fraser River to the U.S. border, and west of the City of Abbotsford. Langley Township is not to be confused with the City of Langley, which is adjacent to the township but politically is a separate entity. Langley is located in the eastern part of Metro Vancouver. From time immemorial, the area that is now Langley Township was inhabited by various Stó:lō nations, including the Katzie and Kwantlen, who continue to live in the area and fish along the Fraser River. In 1955, however, residents of the downtown core (then called Langley Prairie) demanded services that the municipal government was not willing to provide (namely, street lights), and on March 15, 1955, the City of Langley incorporated as a separate municipality. There are 307 buildings / complexes featured. The District of Maple Ridge was incorporated September 12, 1874. It covered an area of 33,000 acres (130 km2) yet only had approximately 50 families living in the town. Maple Ridge is British Columbia's sixth-oldest municipality (after New Westminster, Victoria, Langley, Lake Cowichan, and Chilliwack). Until the expansion of Metro Vancouver (the GVRD) it was part of the now-defunct Dewdney-Alouette Regional District with the city of Pitt Meadows and District of Mission and other north-side communities east to Chehalis. Maple Ridge is made up of several different historical areas, they are; • Haney • Albion • Port Hammond • Whonnock • Webster's Corners • Ruskin • Iron Mountain • Yennadon • Silver Valley • Thornhill • Kanaka Creek - These areas are often identified with a cultural group. For instance, Webster's Corner and Albion are represented by the many Finnish families that settled in the area. While Port Hammond is known for its small cottage like mill houses originally built by the local mill to house its workers. Ruskin is the location of a community hall of the Sons of Norway, while Kanaka Creek originally was a village for Kanaka employees of Fort Langley. There are 170 buildings / complexes featured. New Westminster is a historically important city in the Lower Mainland region of British Columbia, Canada, and is a member municipality of the Greater Vancouver Regional District. It was founded as the capital of the Colony of British Columbia (1858–1866). New Westminster is a vibrant transportation hub, featuring five rapid transit stations and ready access to major highways, rail and water. A city with a “small town feel”, residents of New Westminster share a unique connection. Our many neighbourhoods, from Queensborough to Sapperton, and everywhere in between, have grown over the years and today combine to form a special community. There are 249 buildings / complexes featured. Mission, the core of which was formerly known as Mission City, is a district municipality in the province of British Columbia, Canada. It is situated on the north bank of the Fraser River north of the City of Abbotsford and is part of the Central Fraser Valley. Mission is the 23rd largest municipality in British Columbia, with a population of 34,505 (2006). Mission was incorporated in 1892 and is 225.78 km2 in size. The more southerly portion of Mission is bounded on the west by the lower reaches of the Stave River, which consists mostly of the lakewaters of two hydroelectric reservoirs, Stave Lake and Hayward Lake. The vast majority of the population of Mission lives well to the east of the Stave. Over 50% of the northern land area of Mission is west and north of Stave river; its extreme northwest corner is on the far side of upper Alouette Lake. A small portion of the lower Stave still runs free in its last two miles before its confluence with the Fraser at Ruskin; its last three-quarters of a mile forms the border with the larger municipality of Maple Ridge to the west. There are 37 buildings / complexes featured. North Surrey is bounded by the Fraser River at the north and west, the riding stretches south to 88th Avenue, King George Highway, 120th Street, and 96th Avenue, and east to Fraser Highway and 152nd Street. It is home to 106,904 residents in 2001, more than 46 percent of which are immigrants—21 percent of residents are East Indian, the second-highest concentration in Canada. Within North Surrey is the town centre of Whalley. It is the most densely populated of all the town centres. It is the only town centre in Surrey to be serviced by the SkyTrain (Scott Road, Gateway, Surrey Central and King George stations) and is home to the SFU Surrey campus within the Central City Shopping Centre, the main shopping center in Whalley. There are 318 buildings / complexes featured. The City of North Vancouver is located in the heart of the North Shore. Since 1907, the City has developed into a vibrant, diverse community recognized for its high quality of life and stunning natural environment. The City of North Vancouver is a waterfront municipality on the north shore of Burrard Inlet, directly across from Vancouver, British Columbia. It is the smallest of the three North Shore municipalities, and the most urbanized as well. Although it has significant industry of its own, including shipping, chemical production, and film production, the City is usually considered to be a suburb of Vancouver. 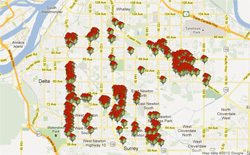 Click Here For North Vancouver on www.bccondos.net - There are 445 buildings / complexes featured. Pitt Meadows is largely a flood plain town, sandwiched between the Pitt River on the west and Maple Ridge on the east. To the north, Pitt Lake is the largest fresh water tidal lake in the world, connected by the Pitt River to the Fraser River, which is the southern boundary of Pitt Meadows. The Pitt River flows backwards at high tide and has created a delta where it joins the lake. The northern sector of the flood plain, closest to Pitt Lake, is largely a peat bog including a large wildlife refuge. On the west side of the Pitt River is Port Coquitlam. The main portion of the town of Pitt Meadows is bisected by the CPR mainline. As of 2003, the CPR intermodal yards and distribution centre west of the town centre are being expanded. TransLink's West Coast Express commuter trains connect Pitt Meadows to Vancouver and Mission. There are 57 buildings / complexes featured. Port Coquitlam is a city in British Columbia, Canada. Located 27 km east of Vancouver, it sits at the confluence of the Fraser River and the Pitt River. Coquitlam borders it on the north, the Coquitlam River borders it on the west, and the cities of Maple Ridge and Pitt Meadows lie across the Pitt River. Port Coquitlam is almost entirely bisected by a Canadian Pacific Railway yard with two underpass crossings and one overpass. Port Coquitlam is often referred to as "PoCo." The area was first inhabited by the Coast Salish people, including the Kwikwetl'em people. The first European settlers began farming beside the Pitt River in 1859. The Canadian Pacific Railway moved its terminus from Vancouver to the banks of the Fraser River in 1911. Port Coquitlam was first incorporated as a municipality on March 7, 1913. 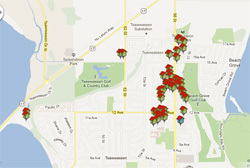 There are 184 buildings / complexes featured. Port Moody is a small, crescent-shaped city in Metro Vancouver, located at the east end of Burrard Inlet in British Columbia, Canada. Port Moody is the smallest of the Tri-Cities, bordered by Coquitlam on the east and south, and Burnaby on the west. The villages of Belcarra and Anmore, along with the rugged Coast Mountains, lie to the northwest and north respectively. It is named for Richard Moody. The construction of a transcontinental railroad was the condition that prompted British Columbia to enter into confederation in 1871. The little town received little attention until it was declared the terminus of the Canadian Pacific Railway in 1879. In 2006, the City of Port Moody had 27,512 people in 10,125 private dwellings living within its borders. There Are 114 buildings / complexes featured. Richmond is a coastal city, incorporated in the Canadian province of British Columbia. The fourth-most populous city in British Columbia. Richmond is part of Metro Vancouver. Neighbouring communities are Vancouver and Burnaby to the north, New Westminster to the east, and Delta to the south, while the Strait of Georgia forms its western border. The city comprises most of the islands in the Fraser River delta, the largest and most populated island being Lulu Island. The city of Richmond includes all but a small portion of Lulu Island (the Queensborough neighbourhood at the far eastern tip is part of the city of New Westminster). The next largest island, Sea Island, is home to the Vancouver International Airport (YVR). In addition to Lulu and Sea Islands, 13 smaller islands make up the city's 129.66 square kilometres (50.06 sq mi) land area. The city also includes the fishing village of Steveston, located in the far southwest corner of the city, and Burkeville, which shares Sea Island with the airport. Both Steveston and Burkeville were independent villages until they were annexed by Richmond. There Are 855 buildings / complexes featured. Sardis is a small community located within Chilliwack five kilometres south of Downtown Chilliwack in the Fraser River Valley located to the south of Transcanada Highway #1. 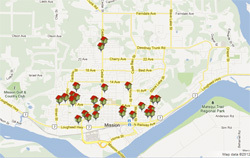 Sardis includes many of Chilliwack's shopping malls and big box stores. Sardis is the gateway to recreational areas such as Cultus Lake and Chilliwack Lake Provincial Parks. There are many outdoor opportunities in the area, including hiking, horseback riding, biking, camping, fishing, and golf. There are 97 buildings / complexes featured. Surrey became incorporated in 1879, and encompasses land formerly occupied by a number of Halqemeylem-speaking aboriginal groups. Settlers arrived first in Cloverdale and parts of South Surrey, mostly to farm, fish, harvest oysters, or set up small stores. Once the Pattullo Bridge was erected in 1937, the way was open for Surrey to expand. In the post-war 1950s, North Surrey's neighbourhoods filled with single family homes and Surrey (not yet a city) became a bedroom community, absorbing commuters who worked in Burnaby or Vancouver. The six "town centres" the City of Surrey comprises are: Fleetwood, Whalley/City Centre, Guildford, Newton, Cloverdale, and South Surrey. There are 388 buildings / complexes featured. Tsawwassen (meaning "facing the sea") is a suburban, mostly residential community located on a peninsula in the southwestern corner of the Corporation of Delta, British Columbia, Canada. 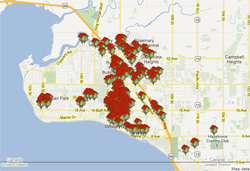 Tsawwassen provides the only road access to the community of Point Roberts, Washington via 56th Street. It is also the location of BC Ferries' Tsawwassen Ferry Terminal, built in 1959 to provide foot-passenger and motor vehicle access from the Lower Mainland to the southern part of Vancouver Island and the Southern Gulf Islands. There are 46 buildings / complexes featured. East Vancouver (also "East Van" or the "East Side") is a region within the City of Vancouver, British Columbia, Canada. Geographically, East Vancouver is bordered to the north by Burrard Inlet, to the south by the Fraser River, and to the east by the city of Burnaby. East Vancouver is divided from Vancouver's "West Side" (not to be confused with the "West End" of Downtown Vancouver or with West Vancouver) by Ontario Street. Historically, East Vancouver has been the first home for many non-British immigrants since the 1880s. It was also a more affordable area and traditionally the home for many lower-income working class. The East Side is best summarized by its diversity – in family income, land use, ethnicity and mother tongue. Click Here For Vancouver East on www.bccondos.net There are 529 buildings / complexes featured. 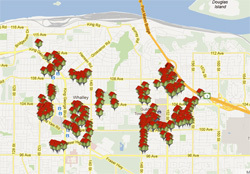 Click Here For Vancouver West on www.bccondos.net There are 1350 buildings / complexes featured. Victoria is the capital city of British Columbia, Canada and is located on the southern tip of Vancouver Island off Canada's Pacific coast. The city has a population of about 80,017 within the metropolitan area of Greater Victoria, which has a population of 344,615, the 15th most populous Canadian metro region. Named after Queen Victoria of the United Kingdom and, at the time, British North America, Victoria is one of the oldest cities in the Pacific Northwest, with British settlement beginning in 1843. The city has retained a large number of its historic buildings, in particular its two most famous landmarks, the British Columbia Parliament Buildings (finished in 1897 and home of the Legislative Assembly of British Columbia) and the Empress hotel (opened in 1908). The city's Chinatown is the second oldest in North America after San Francisco's. 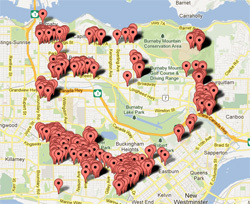 Click Here For Victoria on www.bccondos.net - There are 216 buildings / complexes featured. West Vancouver is nestled on the south-facing slopes of the Coast Mountains on the North Shore of Burrard Inlet, in British Columbia. The Municipality spans 89 square kilometres and is bordered by Howe Sound to the west, the Capilano River to the east, the Coast mountains to the north. This picturesque community is known for its sandy beaches, seaside walks, marinas, hiking trails, ski area, and distinctive residential neighbourhoods. West Vancouver combines small-town charm with cosmopolitan amenities in several unique village business areas. 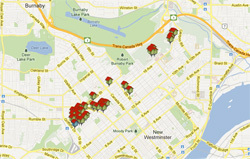 Click Here For West Vancouver on www.bccondos.net - There are 133 buildings / complexes featured. White Rock is named for a distinctive large white boulder on its beach near the promenade, a glacial erratic that migrated south during the last glaciation. The 486-ton granite boulder was kept white by shellfish-eating seabirds whose guano covered the rock, so much so that 19th-century sailors used it as a beacon. The boundaries between White Rock and Surrey are Bergstrom Road (136 Street) to the west, North Bluff Road (16th Avenue) to the north, Stayte Road (160 Street) to the east, and 8th Avenue to the south. The area south of 8 Avenue from Stayte Road westward to where 8 Avenue meets the water is the Semiahmoo Indian Reserve and lies within the bounds of the City of Surrey (though it is governed separately). The Surrey neighbourhoods of Ocean Park and Crescent Beach lie immediately to the northwest. There are 375 buildings / complexes featured.